The mobile Map Editor Notepad app lets you record the path you take and link your comments and photos to placemarks on the map. The Map Editor Notepad is not used in Turkey. You can use Notepad to photograph awnings or signs on organizations, mark the location of a monument or playground, or draw paths through the woods that aren't visible on the satellite image. You can view your notes and routes from your Notepad as a separate layer on YME and make corresponding map edits using them. To log in, open the browser and click the link. — view your location (geolocation must be enabled in your device settings in order for this function to work). — stop recording your path. — save your notes and route to Yandex.Disk. If you have unsaved notes in your Notepad, the button will turn yellow: . and — increase or decrease the map scale. Click and hold the appropriate spot on the map. At the bottom of the screen, a panel will open where you can leave a note. Click Description and enter the text that will be linked to the placemark you selected. Click Attach photo and take a photo (or choose one you took earlier). Click Create to save the placemark's location, description, and photo to your Notepad. Click to save your note to Yandex.Disk. All your tracks and placemarks for the day will automatically be compiled into one entry in Map Editor Notepad, even if you had several sessions over the course of the day. To find out how to view your notes on YME, see section 2.2.5.5. Additional layers: Entries from Map Editor Notepad. See also section 2.3.5. 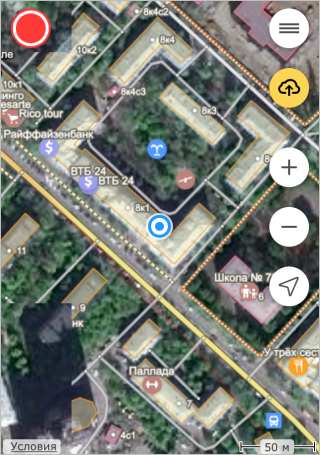 The Yandex Map Editor mobile app.